Sayuri Nail Lacquer's new Speakeasy Collection launched earlier this week and is inspired by 1920s speakeasy culture. 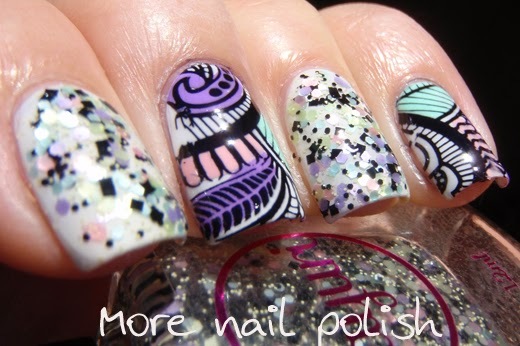 I have three of the polishes from the collection to show you, mixed with a little bit of nail art with how I wore them. 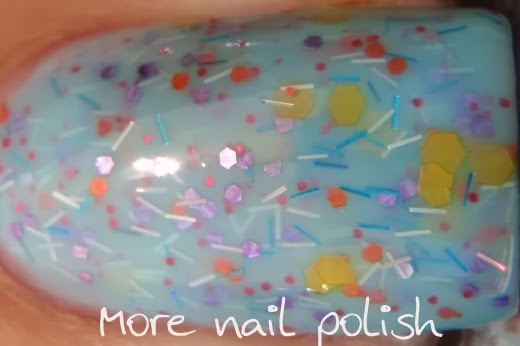 The Cat's Meow - a glitter topper packed with pastel green, lavender, pink, blue, and yellow hexes, balanced out with some black squares and hexes. I layered two coats over white on my index and ring finger. 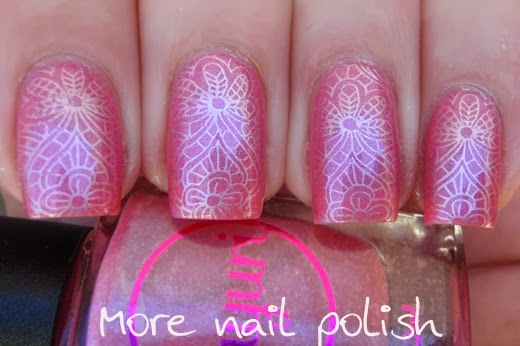 On my middle and ring finger I played around with my new Emily de Molly stamping plates. I stamped in black onto the stamper with a design from EDM02, then just swiped some colour onto various parts of the stamp. The colours I wiped on were Picture Polish wisteria, cotton candy and honey dew. I then let the design dry on the stamper for about 1-2 minutes and then just stamped it onto my nail like I normally would. I didn't use top coat on the stamper to create a decal or anything, and I wasn't really expecting it to transfer onto my nail as perfectly as it did. I'm definitely going to be using this technique a lot more, because it's quick and the results are so effective. I really liked how the black and colours in the stamping design really bought out the black and pastel colours in the glitter. Oh, Horsefeathers! - a of a light blue milky jelly base packed with lilac, orange, yellow, and red hexes. There is also plenty of thin, fine and most importantly flat holographic silver and blue micro bars. My photos don't capture the awesome appearance of the holo bars. I actually really love them in the polish, so many indie brands stay away from bars because they don't get much love, but these fine little holo ones are pretty. You definitely get the feathers feel from this polish. This is two coats with Seche Vite top coat. Spifflicated - a bright pink, than leans slightly coral toned with a fine holographic sparkle and a blue shimmer. The holo is hard to capture in photos, but it's definitely there in real life. This is two coats on its own. I also did a bit of stamping on this design too, but it was really only visible in the shade. This design is from Emily de Molly plate EDM01 and I really wanted to try it because the design was so fine and intricate. I wasn't expecting it to transfer so perfectly because the lines are so thin, but as you can see, it did! I love this plate! Emily de Molly plates are available from the Emily de Molly Big Cartel store. I love The Cat's Meow! The glitter mix is awesome. um wow these are all amazing! Thanks Cathy! I love the stamping combo with The Cat's Meow.